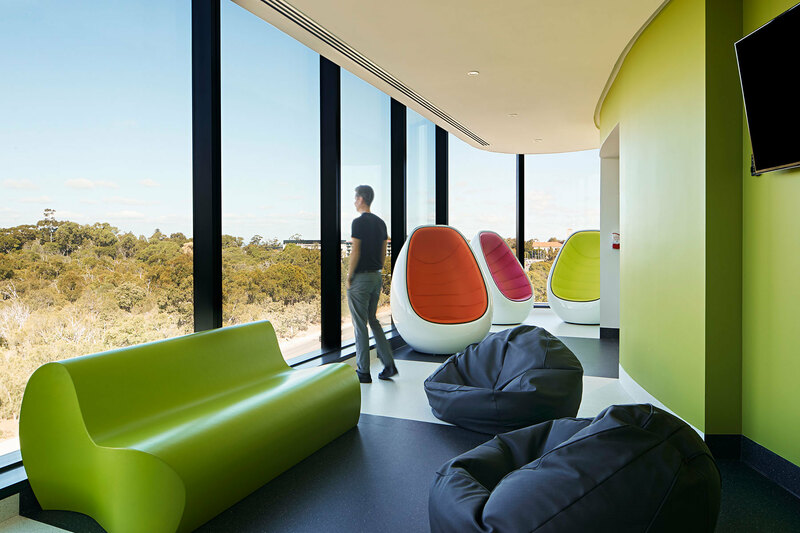 The healing qualities of nature can be found everywhere at the new Perth Children’s Hospital, inspired by the neighbouring Kings Park bushland. The starting point of the design of the hospital, a collaboration with JCY, Cox Architecture with HKS Inc and John Holland, was to anchor the Hospital in its unique surroundings. The nearby flora and fauna of King’s Park inspired a concept for the building based on petals and a stem. The interiors are designed as a series of destinations, with bright colours and organic shapes marking prominent landmarks along the way. The interior colourways reference the incredible bursts of colour from the wildflowers that sweep through Western Australia every year. Instead of focussing a colour in a particular area, there are bursts of a lot of colours. Connection to nature and outside experiences increase people’s wellbeing, and helps to relieve stress for family members, staff and carers, which has a positive effect on the children. The connects are enabled throughout an environment that offers stress reduction through amenities, respite areas, skylights and large windows for daylighting and views, exercise areas/access to the park, landscaping, rooftop gardens. Views in particular are harnessed throughout, from vast and distant views across Kings Park and to the city, to smaller scaled courtyard views. The mental health department, located on the upper floor, features panoramic views and a courtyard that opens up to the sky; a lofty safe haven for children. I think this hospital has jumped ahead of the pack. Patient and family facilities are up there with the best in the world.